The Adder AVIP216 is a KVM switch and KVM-via-IP package that delivers the benefits of an advanced KVM switch with the convenience of remote IP access, providing a powerful server management solution. The AdderView IP combines the advantages of a professional grade KVM switch with the flexibility of global KVM-via-IP access. 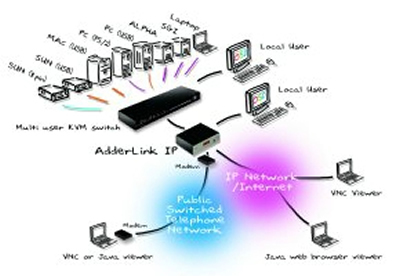 The KVM and IP functions of the AVIP216 are provided by AdderView and AdderLink products, configured to work together as a single integrated system enabling local (server room) and global, IP based control of 16 computers (or more when cascaded). The AdderView IP offers a dual-access KVM switch with On-Screen-Display control and a KVM-via-IP solution that uses HTTP or RealVNC for highly secure connections and high performance. Note: The package provides one IP connection but the product maybe upgraded to provide dual simultaneous IP sessions by connecting a second AdderLink IP. O/S Compatibility All known software and operating systems including Windows (all), DOS, Linux, Unix, BSD, Sun OS, Solaris, Mac OS, Netware etc.